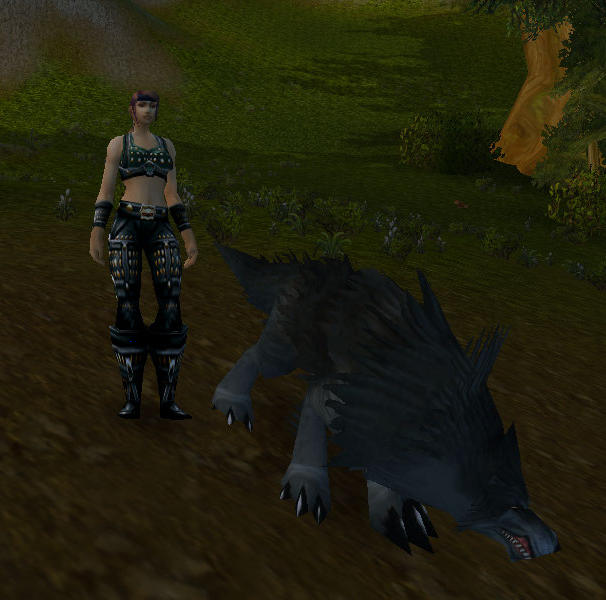 Evolution of a Huntress « It's For My RP Spec! Some people may be shocked to find out I wasn’t always so priest-obsessed. Once, I was a troll mage, Fireballing my way through Kara, TK, and SSC. But much like Tanwen started out as a joke (“Me? Heal? HA!”), I wanted to check out the blood elf starting area with the husband. I couldn’t roll a mage, I already had one! What to play, what to play. And so, Auryon was born. 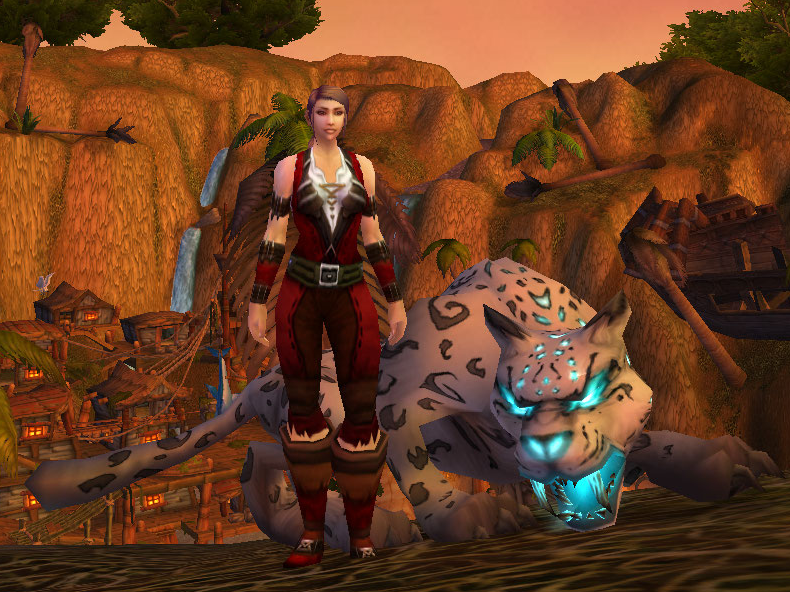 A blood elf hunter (because my very very very first character was a night elf hunter that lasted all of 10 levels before I defected to the Horde) with cat pet after cat pet after cat pet. After leaving the starting area, I decided that I might as well level her! 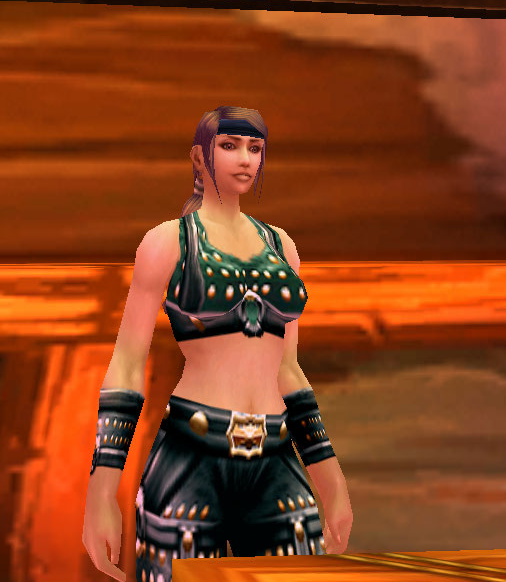 Soon, she became my PvP character of choice in the golden age of BC’s “Steady Shot macro spam for top DPS” philosophy. Sadly, she was cast aside in favor of Tanwen when my little ball of Holy Light was still in her infancy. Because Cataclysm was coming! 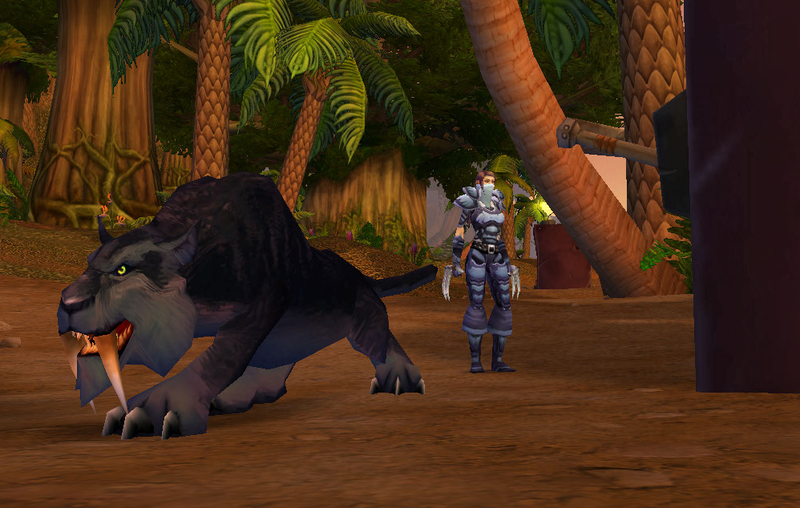 And in Cataclysm, we could have the race/class combination I had always wanted: human hunters. In fact, it’s probably a good thing they didn’t exist when I started playing because my WoW story would probably be very different. 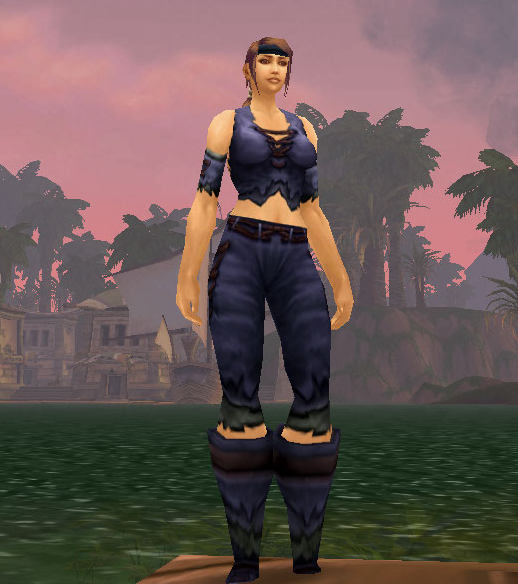 Saturin existed as a temporary character: a outrunner from Ashenvale with extensive knowledge of northern Kalimdor in general. While her character was enjoyable, it was hard to get into much in the way of regular RP when I knew she would just end up being a human anyway. Abriella Delaunay. A Stranglethorn-raised hunter with a knack for stealth and fletching. (As an aside, regardless of my hunter’s incarnation, guns have never been used; she’s even somewhat adverse to crossbows… they’re all too loud.) 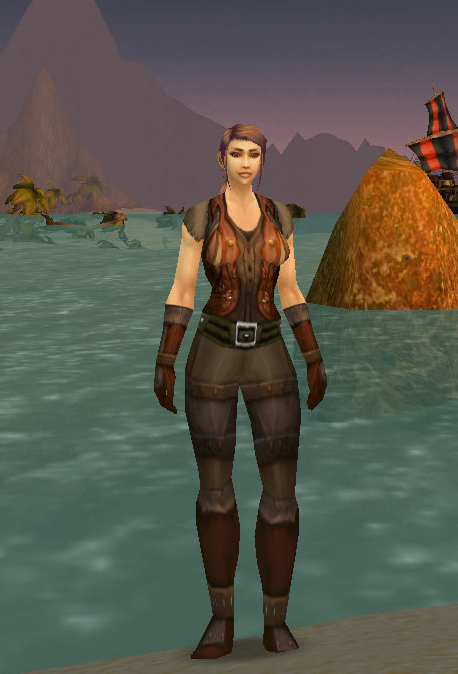 She’s young-ish (mid-20’s) and generally in good spirits, especially when imbibing the cheap grog in Booty Bay. 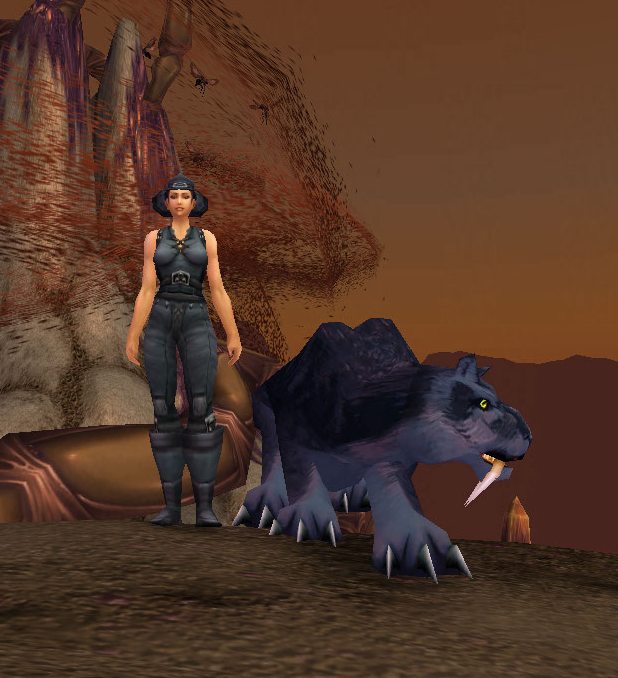 And for some reason, animals just seem to like her, despite the fact that she kills things. SO. Now that I’ve written a novel about my hunter, onto the flag and outfits! Abriella is of average height for her race with a hard-earned muscular build. Well-developed muscle stretches beneath tanned skin. Long, straight brown hair is caught in a leather thong at the nape of her neck. A labyrinth of faint battle scars of varying ages mar her visible flesh. She is obviously no stranger to physicality. She is most often found in well-oiled leathers, designed for ease of movement and stealth. She may have a finely-crafted arrow guard affixed to her bow arm. A matte mithril pendant of two crossed arrows rests at her throat, strung on a tough leather band. A bow and quiver are typically slung across her back. Two wicked claws reside in twin sheathes at her sides. Despite her roughneck appearance, Abriella typically wears a welcoming smile. In fact, she appears quite friendly, if you can get past all the leather and stabbity. The Thick Leather set. This is Abriella’s most common outfit. It’s got that sort of tribal feel to it, befitting a girl brought up in the jungle. There are also some recolors of this outfit, namely the Dervish (green) and Imposing (red) sets, also included in these shots. 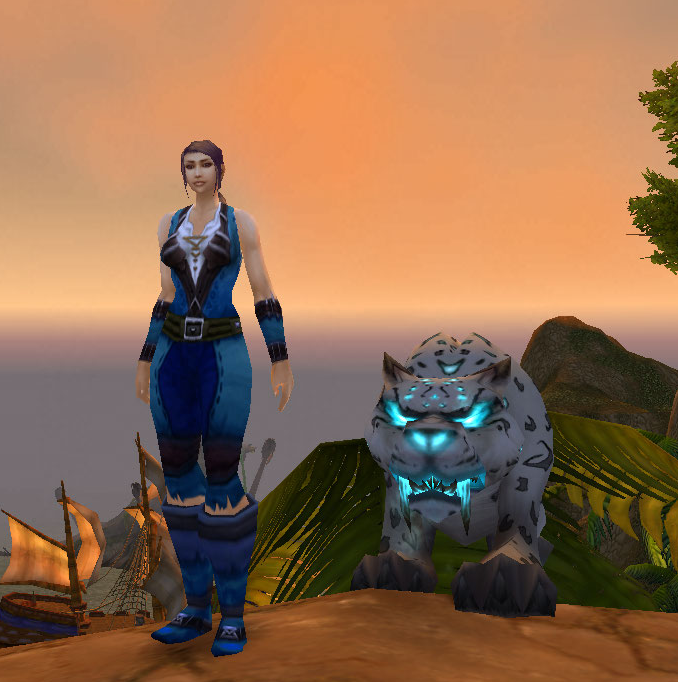 Pictured with her cat (well, spirit beast), Saar. This outfit is from the “set” available in Dustwallow Marsh. I really liked the cargo-style pants and while the top is a bit risqué, I think it fits the outfit. Pictured with her cat, Guinivere. Yes, I know this is rogue tier 0! But it looks like shadowy camouflage, perfect for sneaking around, say, some invasive oil rigs? Abriella likes goblins just fine, just not the ones tearing up Stranglethorn. Pictured with her cat, Vesper. What better way to relax after breaking and entering and destruction of property than taking a nice dip in a cool pool? Ironic that she doesn’t much care for the oil rigs in the jungle but is quite content to hang out on a big oily leaky must-be-bad-for-the-environment barge in the middle of Thousand Islan… errr, Needles. 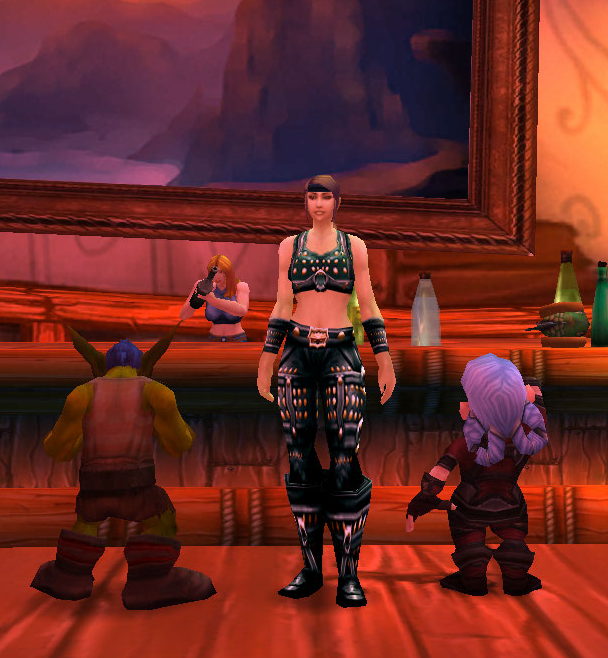 The return of Gilneans to society at large brought lots of great fashion influences. 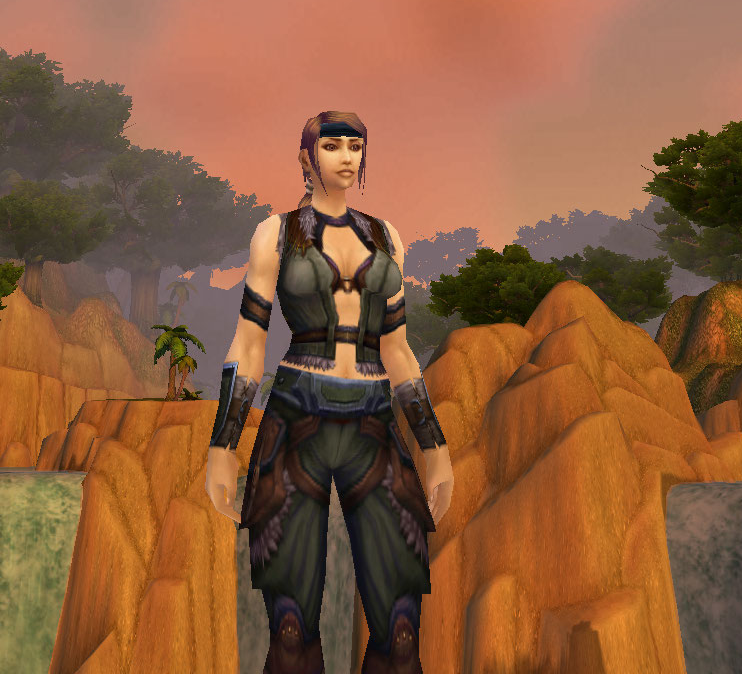 However, Abriella isn’t much for that… this is a pretty functional outfit, despite being designed by the worgen. Pictured with her cat, Duncan. The most necessary accessory in the blindingly hot desert? A hat, of course. Pictured with her cat, Shadow. More rogue gear. 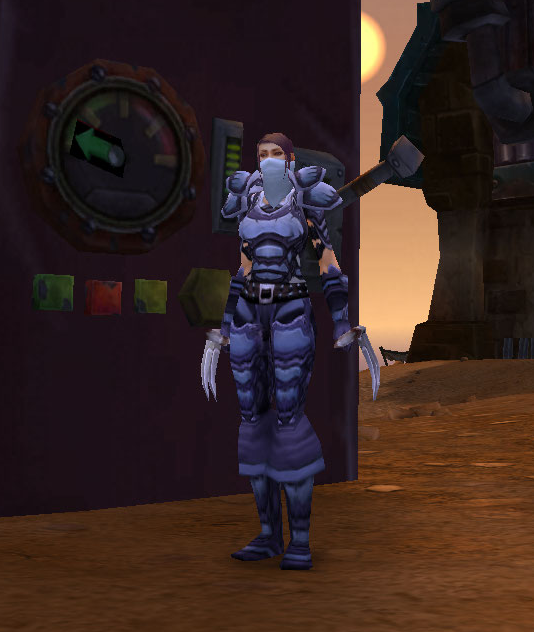 The starting outfit for orc rogues (and probably others). Pictured with her cat (are you seeing a theme here? ), Cathal. A somewhat controversial outfit. You may remember my post about being anti-plate bikini. I AM. Very much so. 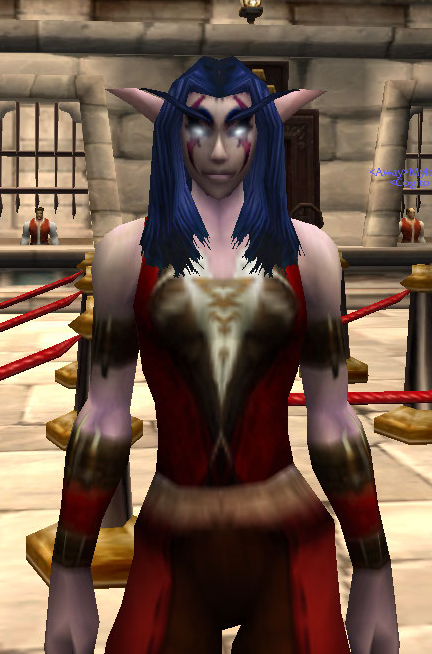 However, Abriella’s personality fits this look a bit more than say, my battle-hardened warrior. It’s also the only mail outfit she has. Pictured with her cat, Sitara. Another three-part outfit. The Glyphed set is one of my favorites. It’s a little more full coverage leather and looks like it could be used as a uniform of some kind. The recolors are the Swashbuckler’s (red) and Tracker’s (green). Pictured with her cat, Aislinn. Jameson, the roboboar. 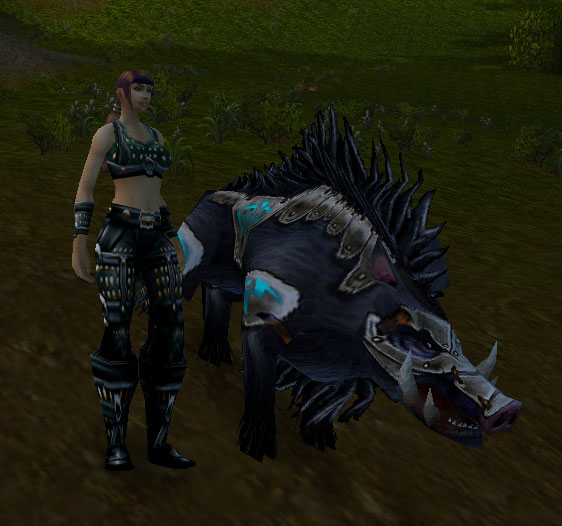 Okay, not really, but that boar model is just too awesome. Ciaran, the oily wolf from Borean Tundra. Umbra. Just a nice, well-behaved wolf. Brennan, ghostwolf from the Plaguelands. Cadewyn, the new skin for Olm the Wise. 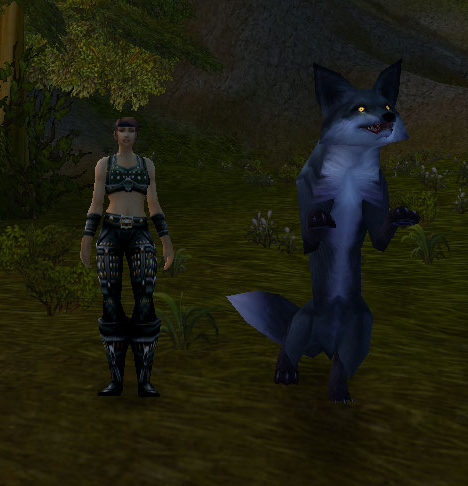 Tiergan, because every hunter needs a dancing fox. Elaxi, flappy crow of in-your-face-ness. Lorcan, a wind serpent from Zul’Drak. Tazara, a recently re-added warpstalker skin. Re. the Glyphed set looking like it could be used as a uniform of some sort — it *was*! 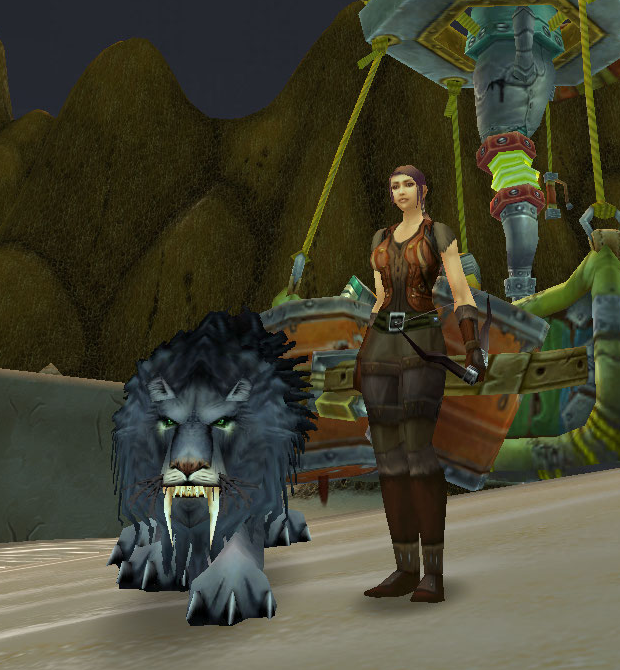 The guards at Menethil Harbor, before it was sunk, wore the Glyphed gear. 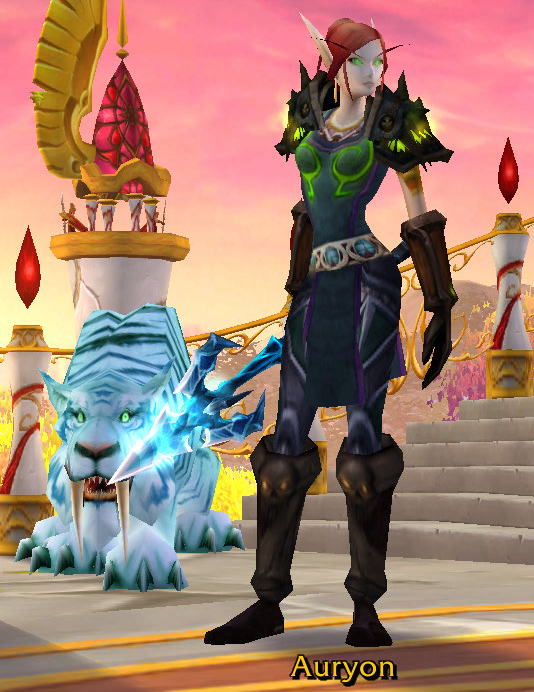 I use the Tracker’s set as an RP set for my Night Elf hunter. I thought so! And I could be wrong but I could have sworn the Swashbuckler’s set was used with Westfall’s People’s Militia; at least the coloring was the same/similar. And you should totally do that post! 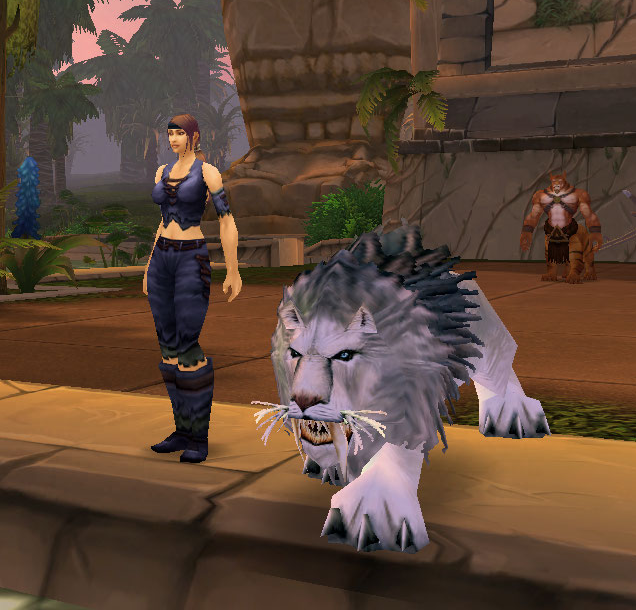 Hunter pets are such a fun was to personalize a character. 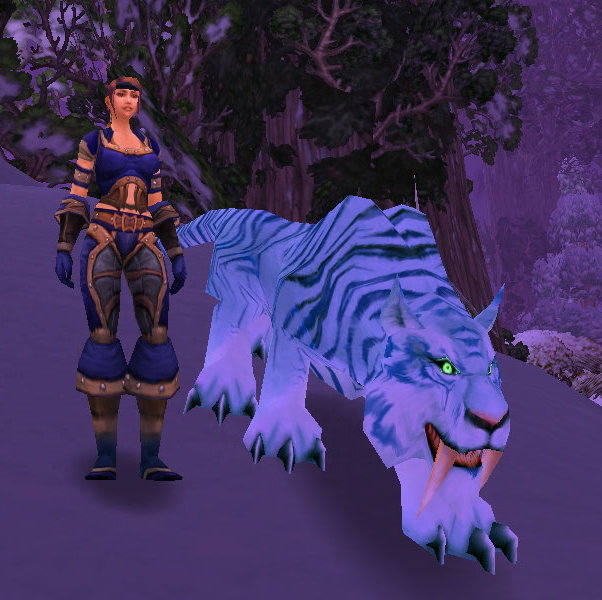 hi i am bill,i play my hunter since vanilla(during vanilla i was just a kid trying to enjoy the game)and played up to wotlk,then i rolled my hpala.but since cata is out i started playing my hunter again(Droku-Stormsscale)and i am really glad i found a hunter who doesnt just care about gear in pve/pvp ur forum gives me each time a new thing to do when i wait for guild-rbg time.all i have to say is thanks for this forum.